Although printing barcodes on hologram labels is possible, it does come with a certain set of limitations. Virtually all barcodes scanners will be unable to scan barcodes that have been printed on holographic foil surfaces. This is because the surface of most hologram labels is metallic and highly reflective, which in turn interferes with the scanner’s ability to pickup the contrast between the barcode and the surface. Barcode scanners need to be able to distinguish this contrast in order to record a scan. As a result we do not recommend printing barcodes directly on holographic surfaces. We can however however produce 2 hybrid approaches that can accommodate holographic elements and a barcode. Both of these approaches are detailed below. Please contact us for further details. 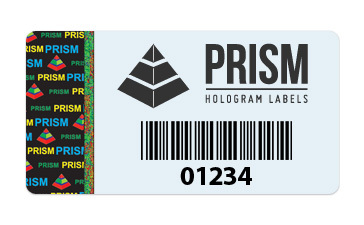 Our first approach is to create a holographic label and then to overprint a white area on top of the hologram label. Then we can print a barcode on the white area. This will give the barcode the necessary contrast needed for a scanner to record the barcode. 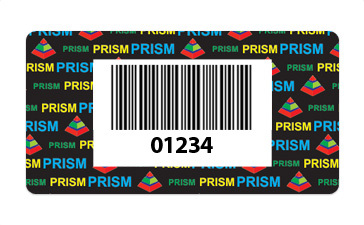 Using this approach however will depend on the overall size of the hologram label in order to accommodate the minimum size required for the printing of the white area and barcode. Our second approach is to use a different material as the base material for the label. The base material will be white in color. The barcode is then printed directly on to this material and the hologram will be stamped on to the base material. This approach works well but is technically not a holographic label and as result can’t accommodate all of the same features.